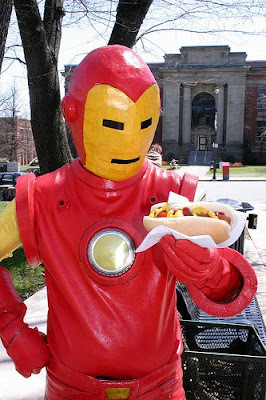 Free Comic Book Day With Iron Man! I've been meaning to post these for days. Here are some pictures from the Strange Adventures Free Comic Book Day 2008 Celebration. It was once again held in the St. David's Church Hall up the street from the shop. There were 20,000 free comic books available to the public. 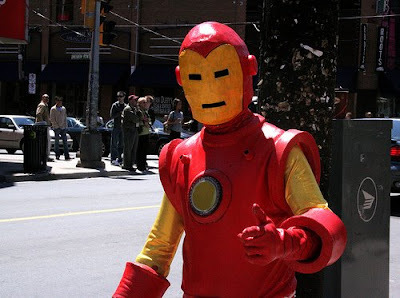 Also...Iron Man was there! 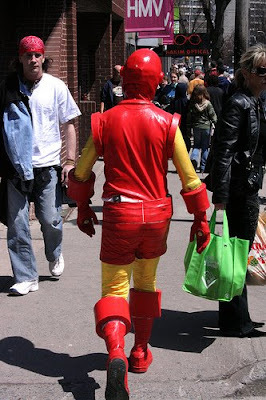 I really can't get enough photos of Iron Man walking around doing stuff. The man in the iron suit is the guy I'm marrying. He can't take credit for making this awesome costume, though. It's the handiwork of the talented Jay Silver. 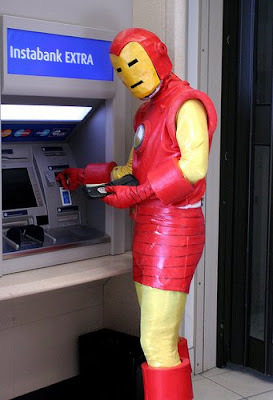 Aw, it looks like Iron Man's snaps came undone in that last one. Needless to say, Iron Man was a huge hit with the kids (and the grown-ups). I'm glad it was a nice day for once.